Did you know that the ratio between the side of any triangle and the sine of the opposite angle is equal to the diameter of the triangle’s circumcircle? I didn’t! I just learned it today when researching the law of sines. All that time spent on the law of sines in high school, and no one ever bothered to tell me that in any triangle, not only are all the ratios between side lengths and sines of opposite angles equal to each other, they are also equal to something else interesting — namely, the diameter of the circumcircle! Rather than explain it in detail, I’ll just let you stare at it for a while, and leave a comment if you have questions. =) The one thing you need to remember from geometry that you might not remember is that an angle inscribed in a circle (like in the above picture) subtends an angle twice as large. This entry was posted in geometry, proof and tagged circumcircle, inscribed angle, law of sine, proof without words, sine. Bookmark the permalink. Cool stuff! I hadn’t seen that before. 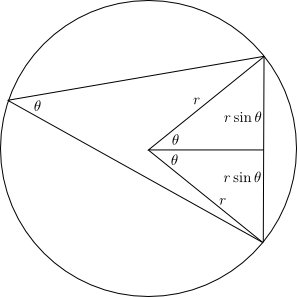 From here, you can find the ratio of the area of the circumscribed circle to the area of the triangle. Gorgeous. And I really didn’t know it. I would have proved it simply by noticing that the angle opposite to the diameter of the circle is a right angle..
Muhammad: It is certainly a good check to ensure that this makes sense when theta is a right angle, but unfortunately that is not a proof that this works for any angle theta. For example, what if I said that when the angle is theta, the length of the chord is 1? This works when theta is a right angle, but obviously that does not mean it is true for any angle. Sorry, but I need to explain myself a little more. Note that I didn’t mean that my proof is any better than yours. Case 1: Take the special case when one of the two sides of the angle \theta is a diameter. 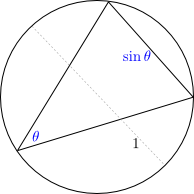 Then the length of that diameter is 1, and the angle against the diameter is right angle so we get a right angle triangle with the length of the chord opposite to \theta equal to sin(\theta)*hypotenuse(=1) which is sin(\theta). General Case: For the general case (as in the diagram) all the angles on the chord are equal (equivalent to all subtending an angele twice as large), so we can select one of these angles, namely one that has a diameter as a side, which gets us to case 1. As I said, it is more or less the same as your method. It is just that that’s the way I first thought of it.. I didn’t know this, and I feel like I was cheated by my geometry teacher. I feel like I should have known this — I am a math professor with a Ph.D. — but I’m comforted to hear that a lot of other people didn’t know about it, either.